This is a beautiful large format 1860 elephant folio map of Turkey in Asia by A. H. Dufour. It covers the modern day countries of Turkey, Cyprus, Iraq, Israel, Palestine, Jordan, Lebanon, Syria, Georgia, Azerbaijan and parts of Iran. This map was issued in the last days of the Ottoman Empire, whose hegemony, though rapidly declining, still influenced much of the Middle East. Various cities, towns, rivers and assortment of additional topographical details are noted throughout. This map was prepared by Auguste-Henri Dufour and engraved by Charles Dyonette for publication plate no. 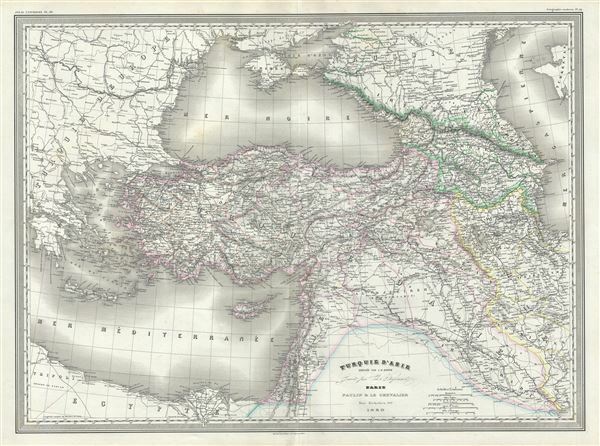 33 in Armand Le Chevalier's 1860 edition of Atlas Universel, Physique, Historique et Politique de Geographie Ancienne et Moderne.